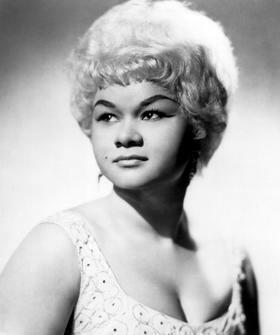 Jamesetta Hawkins, more famously known as Etta James, was born January 25, 1938, in Los Angeles, California, to a 14-year-old mother, Dorothy Hawkins, who encouraged her daughter’s singing career. James would later say, “My mother always told me, even if a song has been done a thousand times, you can still bring something of your own to it. I’d like to think I did that.” James never knew her father. Etta James was a gospel prodigy. In 1954, she moved to Los Angeles to record “The Wallflower.” Her career had begun to soar by 1960, due in no small part to songs like “I’d Rather Go Blind” and “At Last.” Despite her continued drug problems, she earned a Grammy Award nomination for her 1973 eponymous album. In 2006, she released the album All the Way. By the age of 5, James was known as a gospel prodigy, gaining fame by singing in her church choir and on the radio. At age 12, she moved north to San Francisco, where she formed a trio and was soon working for bandleader Johnny Otis. Four years later, in 1954, she moved to Los Angeles to record “The Wallflower” (a tamer title for the then-risqué “Roll with Me Henry”) with the Otis band. It was that year that the young singer became Etta James (an shortened version of her first name) and her vocal group was dubbed “the Peaches” (also Etta’s nickname). Soon after, James launched her solo career with such hits as “Good Rockin’ Daddy” in 1955. After signing with Chicago’s Chess Records in 1960, James’s career began to soar. Chart toppers included duets with then-boyfriend Harvey Fuqua, the heart-breaking ballad “All I Could Do Was Cry,” “At Last” and “Trust in Me.” But James’s talents weren’t reserved for powerful ballads. She knew how to rock a house, and did so with such gospel-charged tunes as “Something’s Got a Hold On Me” in 1962, “In The Basement” in 1966 and “I’d Rather Go Blind” in 1968. James continued to work with Chess throughout the 1960s and early ’70s. Sadly, heroin addiction affected both her personal and professional life, but despite her continued drug problems she persisted in making new albums. In 1967, James recorded with the Muscle Shoals house band in the Fame studios, and the collaboration resulted in the triumphant Tell Mama album. James’s work gained positive attention from critics as well as fans, and her 1973 album Etta James earned a Grammy nomination, in part for its creative combination of rock and funk sounds. After completing her contract with Chess in 1977, James signed on with Warner Brothers Records. A renewed public profile followed her appearance at the opening ceremony of the Los Angeles Olympics in 1984. Subsequent albums, including Deep In The Night and Seven Year Itch, received high critical acclaim. As she entered her 70s, Etta James began struggling with health issues. She was hospitalized in 2010 for a blood infection, along with other ailments. It was later revealed that the legendary singer suffered from dementia, and was receiving treatment for leukemia. Her medical problems came to light in court papers filed by her husband, Artis Mills. Mills sought to gain control over $1 million of James’s money, but he was challenged by James’s two sons, Donto and Sametto. The two parties later worked out an agreement. James released her latest studio album, The Dreamer, in November 2011, which received warm reviews. A few weeks later, James’s doctor announced that the singer was terminally ill. “She’s in the final stages of leukemia. She has also been diagnosed with dementia and Hepatitis C,” Dr. Elaine James (not related to the singer) told a local newspaper. James’s sons also acknowledged that Etta’s health was declining and was receiving care at her Riverside, California, home. Etta James was inducted into the Rock And Roll Hall Of Fame in 1993, prior to her signing a new recording contract with Private Records. James died in Riverside, California, on January 20, 2012, and continues to be one of the most dynamic singers in music.